Houghton Mifflin Harcourt, 9780547734361, 272pp. When your compass is taken away, how do you navigate? Stay-at-home dad Logan Pyle is holding his life together by a thread: his larger-than-life father, Gus, has just died, his wife is distant, and his kindergarten-age son has regressed to drinking from a baby bottle and sucking his thumb. Complicating matters further is Bennie, Gus’s beautiful young widow, with whom Logan has a troubled past. When the thread finally snaps, Logan’s actions threaten to tear the family he treasures apart. Carried by Logan’s wry, original voice, this moving debut follows one man’s journey from child to parent. "A fast-paced tale of family life." "What a treat to read Miller's whip-smart first novel. Brand New Human Being gripped me with its wry humor and wonderfully real characters, and kept me captivated until the last page. This is a fast-paced, first-rate book by an immensely talented new writer." 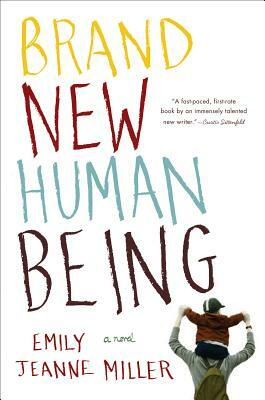 "The strength of BRAND NEW HUMAN BEING is its realistic portrayal of trauma and its aftermath. Death, birth, disease and survival all have their messy consequences in these pages. Miller...is especially good at showing the sloppy nature of relationships in the wake of upheaval." "Touching...Miller explores Logan’s resentments and insecurities with sensitivity and nuance." "Miller is at her best in scenes with Logan and Owen together—dad’s brutal honesty with his son about death in general (and Owen’s near-death experience in particular) exposes the depths of his emotional frustration...the first-person-present narration gives the novel a breezy energy. A solid debut..."
"This respectable debut follows the mostly self-inflicted trials of Logan Pyle as he navigates the suddenly confusing waters of fatherhood, marriage, and complex family history...this coming-of-age novel for adults peels back [Pyle's] emotional layers as he tries to find firm ground in the shifting continents of his life."